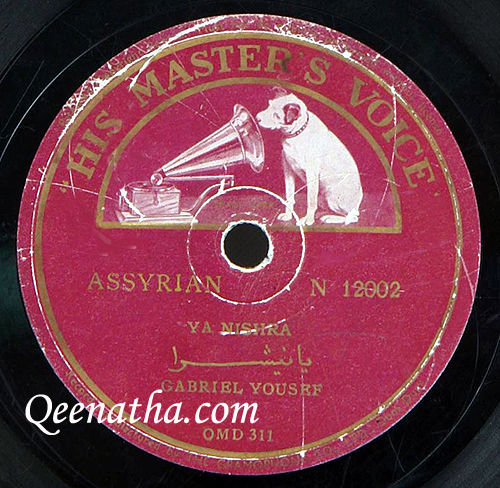 The earliest Assyrian Gramophone (shellac) records in Middle East were released in Iraq, this was during the time when international record companies were working and producing records for different nationalities and in different languages. 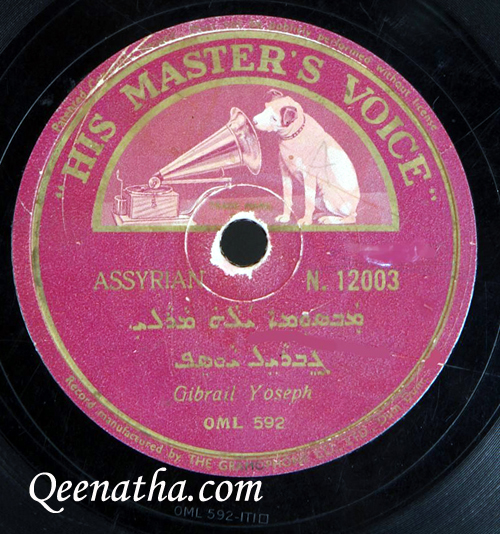 The two main companies were the British “His Master’s Voice” and The American “Columbia” Labels, later a local company (Ashtarphone) produced at least two Assyrian records that we know of, and I will be showing those two records at the end of this article. 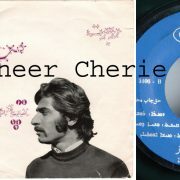 Other domestic and regional labels gradually became involved in producing records in the Middle East, however Assyrian songs have only been found on the two international Labels mentioned above. But political instability, and revolutions put an end to such collaborations. These political changes brought Pan-Arab nationalism and dictatorships which resulted in the persecution of minorities not only politically but culturally. 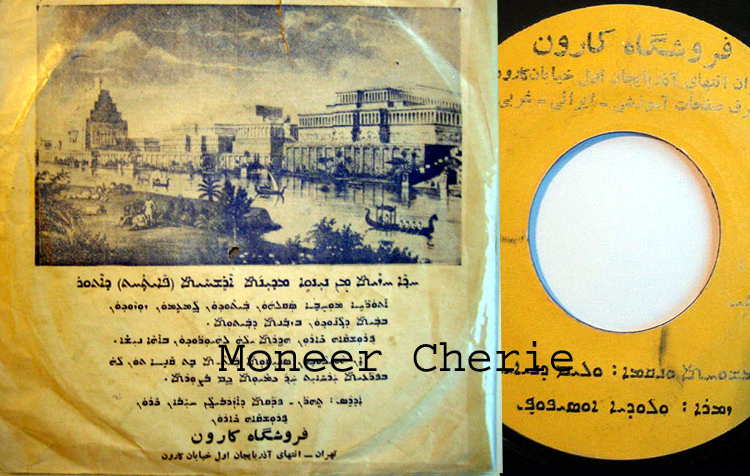 Even when domestic record companies were established they never ventured to produce record for Assyrian Singers, companies like Chakmakchiphon, Neayem, Baidaphon and Philips. None of the Middle Eastern regimes allowed Assyrians to have their own Social Media, be it Newspapers, Magazines, Radio or TV channels. And no schools to teach their language, and as a result of that, and other suppression, today most of our people don’t read and write in their own language. The only source of Media that governments tried but couldn’t totally block was Assyrian songs. Assyrian albums kept arriving one way or the other from the West to the East, and Assyrian songs kept filtering into our social life. 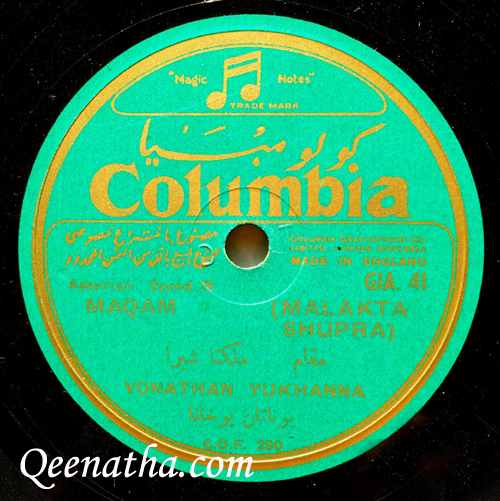 I will start with the first record, this record was released in Iraq in 1931 by Shamasha (deacon of the Catholic Church) Hanna Petros, (1896-1958), he released two Gramophone records (78rpm), on the British “His Master’s Voice’ Label, one was called “Baydakh d-Ature” G.D 89, and the other “Karuzuta d-Hasha” G.D 111, as you notice from the titles, the first record contained two magnificent national songs, and the second record had two Church Hymns. These two records were pressed at the plant in England UK. 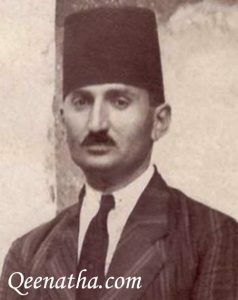 Hanna Petros was not only a deacon, a singer but a composer, and the founder of music education in Iraq, which included (but not limited to) the Iraqi Army Music Department (1923), the Baghdad Music Conservatory (1936) and the Iraqi Police Music Band (1941). Gabriel released Five records on the British owned “His Master’s Voice” Label. it hasn’t been easy locating all five original records, especially that many of the copies have not survived, or are in the hands of none-Assyrian collectors. 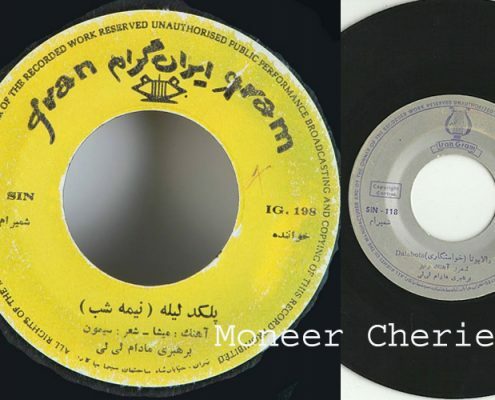 These records were pressed at Dum Dum plant in Culcatta, India and shipped to be sold in Iraq. 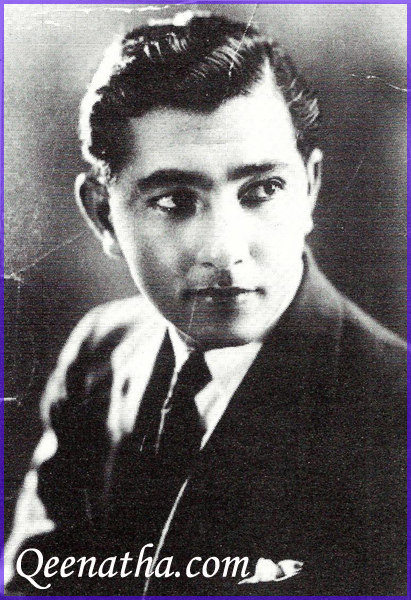 On this track you will hear a short sound bite from an interview with the late Gabriel Yosip Sayad, conducted in 1986 for an Assyrian radio program in Sydney, as he introduces the song “Ya Nishra” which was recorded in Iraq on this record below in 1935. Oshana Youel Mirza is considered the first Assyrian popular singer and the most influential during his time, most of our legend singers were inspired and influenced by his voice and songs. 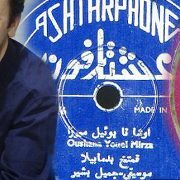 Ashtarphone record company was owned and operated by the Bashir family in Baghdad, they later changed their name to Bashirphone when Jamil Bashir took over the running of the company. Bashir family are famed for their mastering of the UD in both the making and playing, both Munir and Jamil were masters of the instrument. But only Jamil was involved in recording and releasing records for various Iraqi Minorities and Arabs. 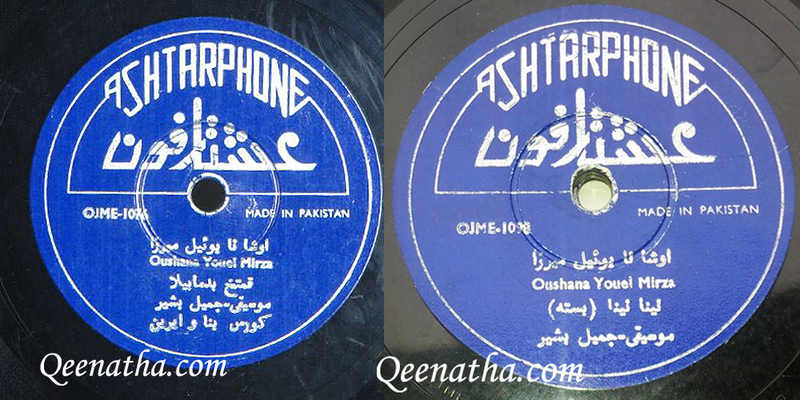 These two gramophone records were released by Oshana Youel Mirza on Ashtarphone probably in 1958 or earlier. Later Bashirphone only released Vinyl records. 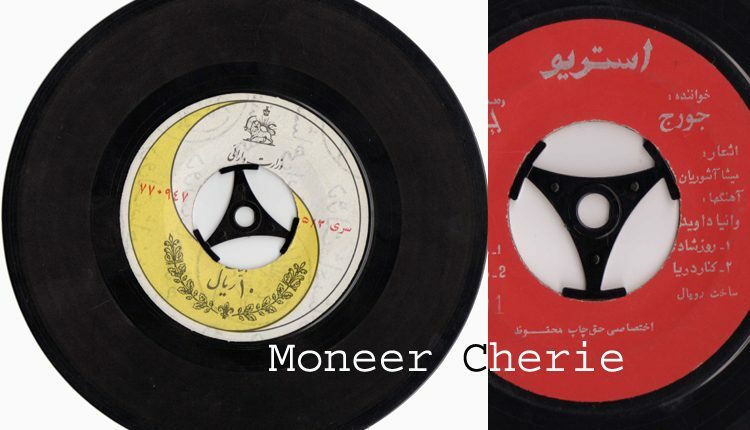 Both records were pressed in Pakistan and then shipped to be sold in Iraq. 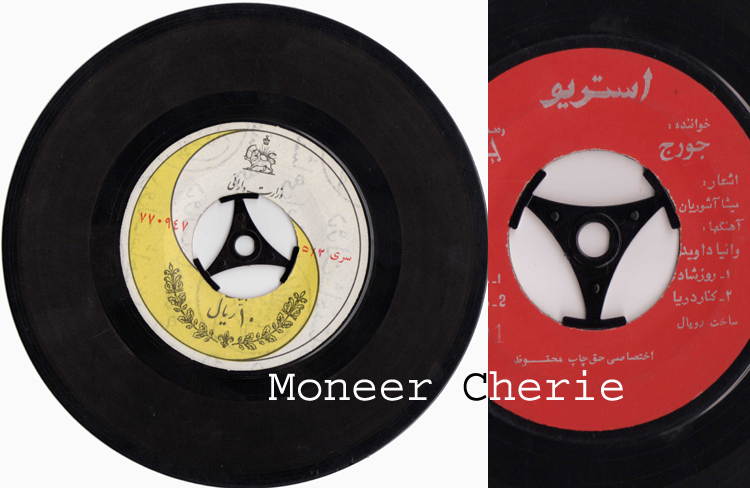 Those have been the only Shellac records that we have been able to find in Iraq. But our search continues and maybe one day we will find more, it has been said that even late Biba or Albert Ruel may have at one time recorded songs on Gramophone records, but nothing has been found yet. *As information, photos and songs collected in my archive for many years are gathered from many different sources, I would like to thank and acknowledge everyone who has helped me over the years, and for those who have given permission to use some of their information in my articles, and also for those who have refused. But one hand can’t clap. 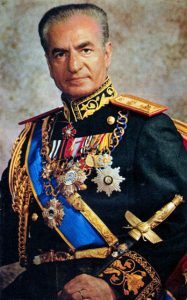 During the reign of Mohammad Reza Pahlavi, or better known as the Shah of Iran, Assyrian music flourished in that country. He was secular, a pro-modernization and pro-secularization. He reigned from 1941 to 1979. In this presentation I will be showcasing some of the most iconic records released during that period. 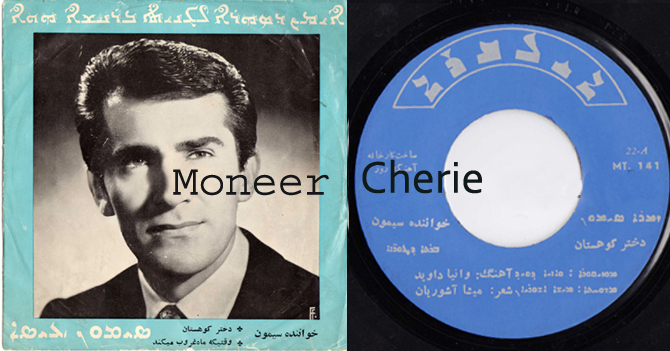 This is a glimpse into the beautiful music that came out in Iran, we still don’t know what else is out there waiting to be discovered. My information are based on the actual records that I have been able to obtain either as hard copies or as digital copies. All with the help of a small network of friends including Abboud Zeitoune, and the internet. When it came to researching early Assyrian records in general, the first hurdle we faced was, as Assyrians we don’t have a music archive, a national archive that we can tap into and utilize to learn and expand our knowledge, so we had to build our own collection from Zero, and then begun to understand what is really out there, and what has our pioneer singers and musicians produced. Recorded Assyrian music has now past the 100 years mark, but the search continuous and who knows what old records are still waiting to be discovered. The records on this page are listed according to the years they were released in, or at least the years we think they were released in, as we have not been able to find any record-Catalogues from Iran which can help us date them more accurately. 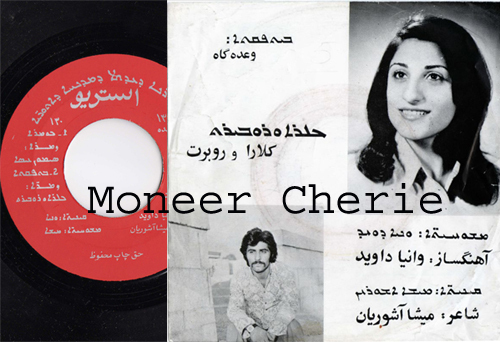 This EP record with its original photo-sleeve was released in Iran in 1961 by Lilli Tamraz (standing in the b/w photo on the left of her Shamiram group which she managed), She was the project Manager of this EP too, and she wrote the lyrics of three songs on it, Music was Folkloric. (EP stands for Extended Play), since most records had only two songs, these EPs contained four songs. The fourth song was written & music by Edison. This EP was released on Royal Label, RT-2415, the four songs were titled 1-Go Karmane sung by Shamiran group 2-Aman Amaneh sung by Edison 3-Hury Pary sung by Shamiram group 4-Yemi sung by Edison. 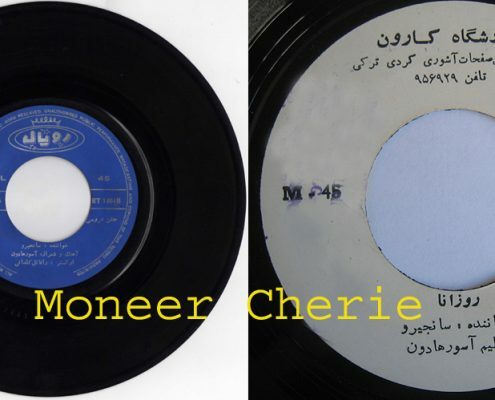 This record was released by Sankhiro Khofri in Iran in 1964, originally released on Royal Label, RT-1464 (the blue), but then re-released on Foroushgah Karoun (the white on right) N#5193, two songs titled: 1-Rozana: Lyrics by Shmuel Benyamin, Music by Asarhaddon 2-Kalu: Lyrics & Music by Asarhaddon Khofri. Valodiya Ossiboff released this record in 1965, it was released on Foroushgah Karoun label #309,(The first released could have been in USA and later re-released in Iran), it came with two Assyrian songs 1-Nineveh written by William Daniel 2-Mokhepta Diyi, it came in this Assyrian pocket Sleeve (below), with a text caption describing the Ancient Assyrian capital city of Nineveh. 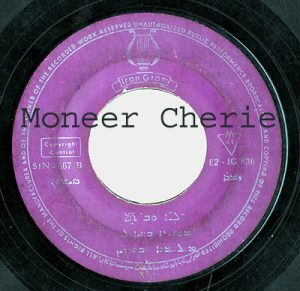 Simon Issa released this single in 1965 on Monogram Label with two songs, #4141, written by Misha Ashourian and Music by Vania David 1-Yimma 2-Qessat D Prashta. No sleeve has been located for this record yet. 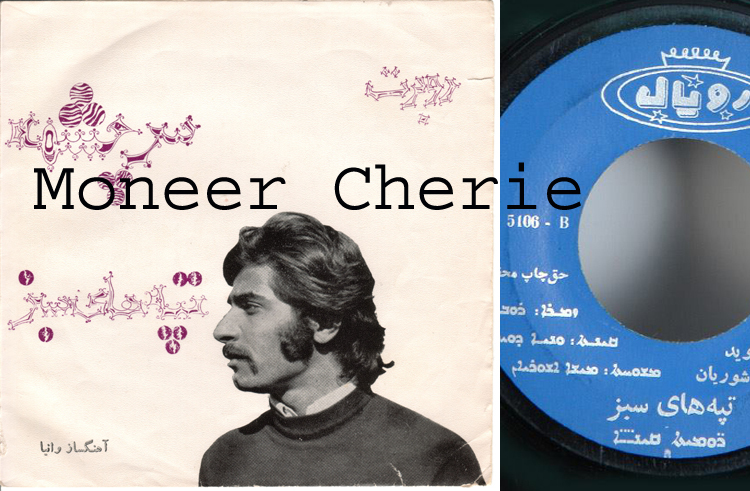 Narmella released her only Assyrian single in 1966, it was released on Iran Gram Label (Yellow) IG-168, then it was re-released on another Iran Gram Label but with a different design 61-IG-168 (light blue), her two Assyrian songs were 1-Shara 2-Brata Shaperta, music: Armenian. 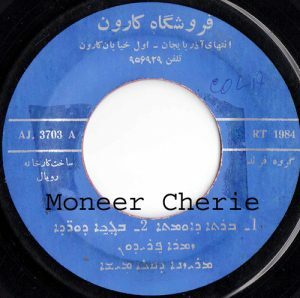 As for the photo cover, this was one of her many singles in Farsi, this one was released with the Assyrian singer Edmond Ternian (both songs were in Farsi released in 1970). No Sleeve has been located for the Assyrian single record. First press of this record by Daruis Saatloo could have been in USA in 1966, later re-released on Royal Label RT-1272 in Iran, and it was also re-released as an EP on “Oriental” Label with AR-922 number, which is a serial number I associate with Ahang e Rooz Label. 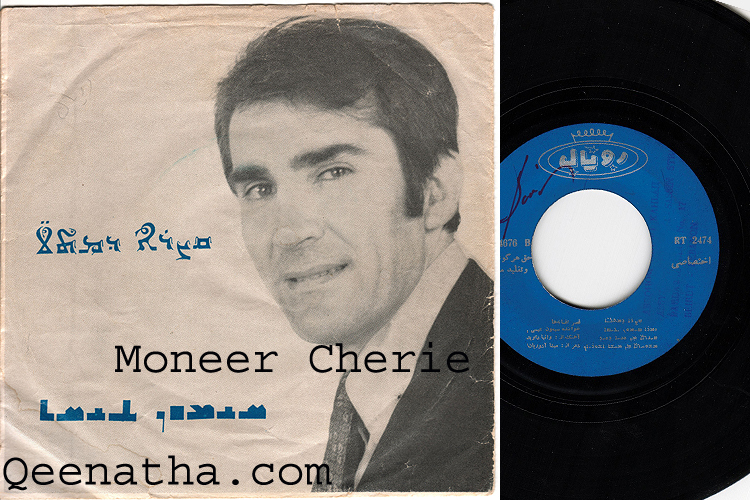 The royal record came with two Assyrian songs both Lyrics & Music by Victor Khodobakhsh; 1-Marya 2-Brated Kokheh, this single was later re-released (for the third time) in US on a Label called “Assyrian Records” in Hollywood California (not showing here). Shamiran Issaby released this record in 1966 with two Assyrian songs 1-Taliboota Lyrics & Music by Venis 2-Palga d Leleh written by Simon Amirkhas, Music by Misha Ashourian. 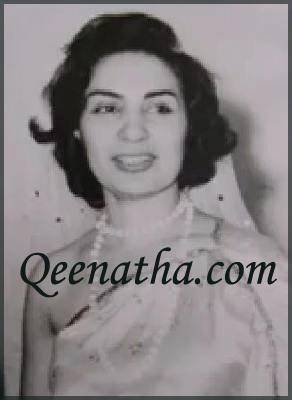 Shamiran Issaby is the wife of late Nebu Issabey the well know music composer and director from Iran who lived in California, his son is the famous music composer and arranger Tiqlat Issabey. 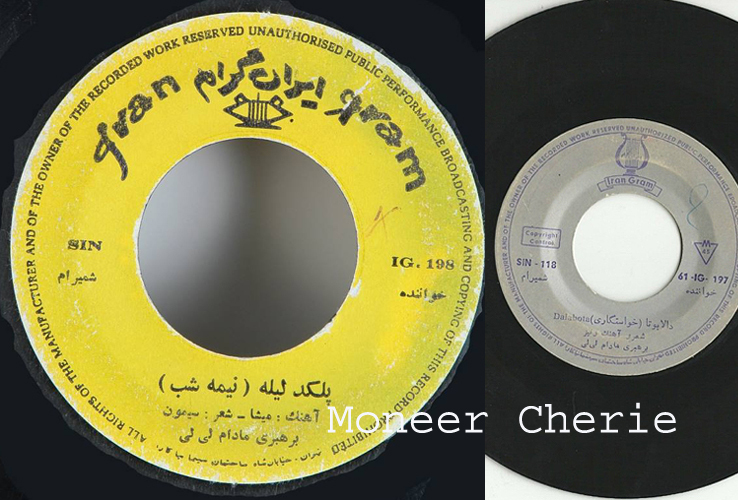 The record was released on IranGram, IG-197 (yellow), then re-released on another IranGram Label with different label design, 61-IG-187, no sleeve has been located for this record, (incl. photo of singer). This record was released by Simon Issa in 1967 with two songs titled 1-Yale W Bnateh 2-Prashta, Lyrics written by Daniel and Music by Sooren Alexander. Record was released on IranGram Label, 62-IG-836, and no Sleeve has been located for this record yet. This record was released by Simon Issa in 1968 and it came with a beautiful Photo Sleeve, the two tracks in this record were titled 1-Brata d Turaneh 2-Iman Sahra b Gneta, both written by Misha Ashourian and Music by Vania David. it was released on Eilbera Label, MT-141. 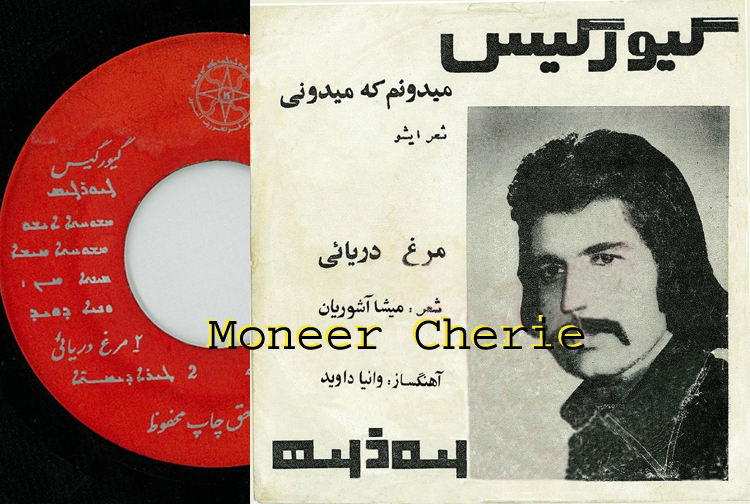 Freidon Bet Oshana released this EP in 1971 with a Royal serial number RT-1984, which means this was probably released on Royal label, this version was sold by Foroushgah Karoun. Record came with three songs 1-Brata d Umta 2-Bakhcha D Wardeh 3-Khigga d Sheshta, All Lyrics written by Albert Iwas, music arranged by Misha Ashourian. 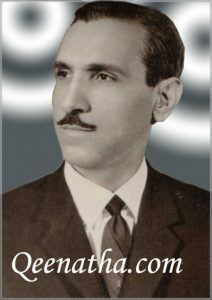 Robert Ibrahimi released this record in 1973 on Royal Label, RT-2689, in Iran with two Assyrian songs titled 1-Rumyateh Qineh 2-Al Ayna. Lyrics by Misha Ashourian Music by Vania David for both songs. This single came with a beautiful photo sleeve. George Sarvanus released this record in 1973 on S.A.D Label, I don’t have any information about this Label, the record has two songs 1-Ramina 2-Youma Mitrana (Rainy day) Lyrics by Misha Ashourian and Music by Vania David for both songs. And this record came with a beautiful photo sleeve as well. Robert Ibrahimi and Clara Nassara (later: Shino), released this record in 1974 on Ashur Gram Label, with two duet songs titled 1-Lina d Khamra Lyrics Iramia Sliwa Music by Vania David 2-Brata ta Tlubli, Lyrics by Iramia Sliwa Music by Vania David. This is the original Sleeve showing both sides. 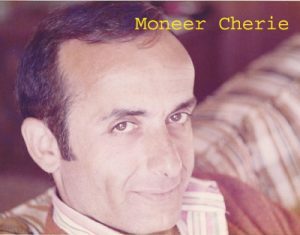 Shlimon Bet Shmuel was forced by the Iraqi regime to leave Iraq, and entered Iran on the hope of immigrating to the west, and while being in Iran he released this single record in 1974 containing the immortal song of Semeleh, written by Dinkha Esha and Music by Shlimon Bet Shmuel, the song commemorate the Genocide committed by the Iraqi Army against the Assyrian civilians living in the Semeleh region of Iraq. This music project was financed by the Assyrian Iranian Federation and released on a privately produced Label. Later a 2nd version of this song was remastered and released in USA. 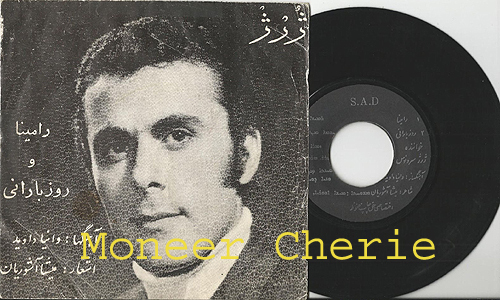 Simon Issa in 1975 released dual-singles in a foldout pocket-Sleeve, it was released on Royal Label, RT-2474, The four Songs were titled 1-Qasra d Matleh 2-Libba D Yimma 3-Kalo D Dashta (feat.Mariam Amirian) 4-Aywateh Metraneh. All Lyrics were written by Misha Ashourian and Music by Vania David. and came with its original photo Sleeve. 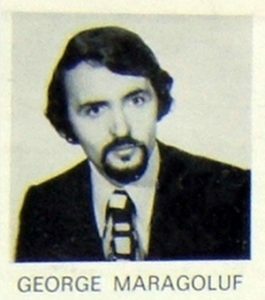 Gewargis (George) Munaphy released this record in 1977 with the participation and assistance of the Assyrian Folkloric group of Ashoor, wih their logo on record as a “Label”. 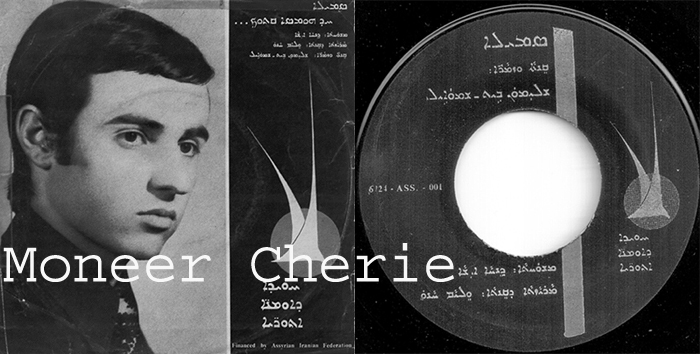 Record came with two songs 1-Bidayen at Bidayet, Lyrics written by Isho, and Music by Vanid David 2-Tera D Yamateh Lyrics written by Misha Ashourian and Music by Vania David. 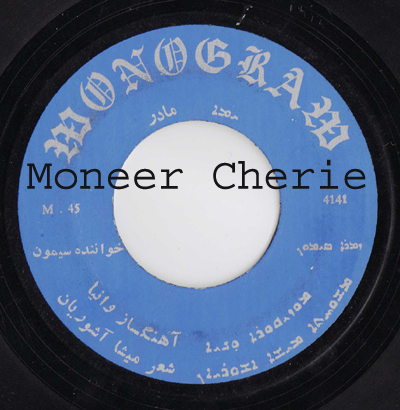 This Single was released with two songs one sung by Clara Nassara & Robert Ibrahimi, and the other sung by Simon Issa, the record was released in 1975 on “Stereo” label, Number 130, Clara & Robert song is titled 1-Bet Tpaqta written by Misha Ashourian and Music by Vania David. Simon Issa song is titled: Kumra, Lyrics written by Misha Ashourian and Music by Vania David. I hope you have enjoyed this short Journey into early Assyrian records and songs from Iran, after all music is part of our culture and heritage, and it has to be collected and preserved for us, and for our future generation, hope to see you in my next presentation.